The River, a fast-paced thriller, is the story of a woman's search for her father in the mysterious wilderness of the Nahanni River in Canada's Northwest Territories. This area, which is referred to as the "Bermuda Triangle of Canada" in real life, is frought with dangers, and not all of them are from nature. In this conspiracy based thriller that has been compared to Michael Crichton's Timeline and Dan Brown's Angels & Demons, Del takes a group of near strangers down the Nahanni River in hopes of finding her father whom she'd thought was dead. What she finds is a secret underground river and a deadly world of nanobots and painful serums. How far have we gone with our technologies before we've gone too far? And at what point have we become God? The River is a mix of LOST and Mission Impossible--Canadian style. 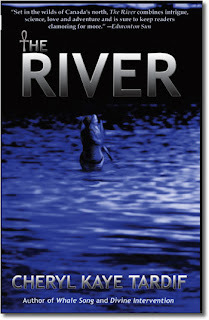 If you enjoy lots of action, explosive chase scenes and impossible odds, you'll love The River. For US readers, order The River from Amazon using the Amazon Prime program and your book will arrive in 2 business days, with FREE shipping. Canadian readers, order The River from Chapters.ca.